Dear conquerors who will receive some of the hidden manna: grace, mercy, and peace to you from God the Father and our Lord and Saviour Jesus Christ. Amen. We know Balaam best as the prophet whose donkey spoke to him. The people of Moab had come against the people of Israel, and the Moabite king, Balak, summoned Balaam to curse the Israelites in exchange for honour and many rewards. God told Balaam not to go. However, upon being promised even greater honour and rewards by King Balak, Balaam again asked God if he could go because he wanted honour and rewards from the Moabite king. God permitted Balaam to go, but was not pleased with him or that his heart was attempting to serve two masters, both God and mammon (Nu. 22:1-20). The angel of the Lord would have killed Balaam on the way, had his donkey not turned off the road, pushed against a wall, and eventually laid down under Balaam. Balaam beat his donkey, to which his donkey proceeded to speak with him until God opened his eyes to see the angel. The angel rebuked Balaam’s way as perverse, and once again he was told not to say anything that God didn’t command him to say, thus he was not to curse the people of Israel (Nu. 22:21-35). Balaam did not curse the Israelites because God told him not to, but he was nevertheless instrumental in encouraging the Israelites to commit immorality and idolatry with the Moabites (Nu. 31:13-16). He couldn’t curse the Israelites, so he advised the Moabite women to invite the Israelite men to their idolatrous feasts. Balaam thus schemed to make the Israelites turn away from God and worship idols so that they would incur God’s wrath and thus be cursed by God. Part of the worship of Baal included sexual orgies to gain the favour of Baal. The Israelite men were enticed by the Moabite women to join them for these orgies. Thus, God commanded the judges to execute those who had whored with the Moabites and yoked themselves to Baal. God also struck the people with a plague so that twenty-four thousand of them died. As the people were mourning over these executions and deaths, a chief of a house of Israel brought into the camp a Midianite woman in the sight of Moses and all the congregation of Israel, and they went into his tent. Brazenly, and openly, he went to commit fornication even while God was punishing the very sin in the congregation. Phinehas, being zealous for God, went and slew both the man and the woman with a spear, following God’s command to execute those who sinned in this way. Because of Phinehas’s actions, God stopped the plague and blessed Phinehas to be the high priest, and his descendants after him in perpetuity. Balaam, on the other hand, was killed when Phinehas and the Israelites attacked the Midianites, with whom Balaam dwelled. The church in Pergamum did not heed the warning that these historical events teach. Christ condemned them for having those in their midst who held to the teaching of Balaam and thus committed idolatry and sexual immorality. These are the same teachings of the Nicolaitans, as we heard two weeks ago in the sermon on the letter to Ephesus, whose works Christ says that He hates (Rev. 2:6). Should the church in Pergamum have speared the idolaters and adulterers like Phinehas did? No, because the command to execute was given by God through Moses to the judges of Israel who had authority to execute justice over the people of Israel. The church of Christ has no such command or authority. Rather, as we heard in the letter to Corinth (I Cor 5), the church of Christ has the command and authority to deliver such impenitent idolaters and adulterers to Satan, to cleanse the leaven out of the church. That means they are to be put outside the fellowship of the church through excommunication. Outside of fellowship with Christ, there is only fellowship with Satan, thus excommunication is called being delivered to Satan. This the church in Pergamum was not doing, thus Christ tells them to repent or He’s going to war against them with the sword of His mouth. They are thus commanded to repent and purge the evil persons from among them. Rather than being arrogant and puffed up about the sinners in their midst, they should have been mourning over the sin and over the spiritual death of the sinner (cf. I Cor. 5:2). Understand that this is not a command to excommunicate every sinner in the church. If that were the case, there would be no one remaining, not even a single pastor. Rather, it is a command to excommunicate the sinners who refuse to repent; sinners who boldly and openly live in sin and refuse to turn away from it, like the Israelite who went to fornicate with the Midianite woman in front of Moses and the whole congregation of Israel. Thus, we do repent. We hate our sin. We hate our weaknesses. We repent of those times we have been sexually immoral or greedy. We repent of our idolatry – all those times when we have feared, loved, and trusted in anything other than God. We repent of those times we have reviled others through verbal abuse; those times we have had too much to drink; those times we have swindled others by taking advantage of them. We also repent of those times we have tolerated open sin in our midst instead of mourning over it and mourning over the spiritual death of the sinner. The entire life of a Christian is to be one of repentance. It is a daily drowning of the Old Adam along with all sins and evil desires. We repent daily, because we sin daily. Christ does not threaten the repentant sinner, but the unrepentant sinner. He says, “Therefore repent. If not, I will come to you soon and war against them with the sword of my mouth.” The sword of judgment is for those who do not repent. To the repentant sinner, however, Christ promises to give him some of the hidden manna. In Scripture, manna is called the grain of heaven and the bread of angels (Ps. 78:24-25), thus this promised manna is a promise of eternal life in heaven – hidden now, but to be revealed when Christ returns. We have the promise of a place at the wedding feast of the Lamb in His kingdom which has no end, where we will eat the food of angels. We also have a foretaste of the feast to come in the Lord’s Supper. The Lord’s Supper is hidden manna because the future banquet is hidden from view, and the presence of Christ in the Supper is also hidden, not visible, but nevertheless real and as certain as Christ’s own promise: “This is my body… This is my blood.” (Mt. 26:26, 28; Louis Brighton’s Commentary on Revelation) In the Lord’s Supper, repentant sinners receive the forgiveness of sins earned for them by the suffering and death of our Lord Jesus Christ, thus the body and blood of Jesus give us eternal life. Repentant sinners are also promised a white stone, with a new name written on the stone. Stones were used by judges in declaring a verdict: a black one for conviction, a white one for acquittal (BDAG). This white stone can thus be seen as a declaration of innocence, an acquittal of all charges. Through giving us a white stone, the Judge of the living and the dead declares us acquitted of all charges and sins which we have committed. The new name on the stone suggests Baptism, when the name of God the Father, Son, and Holy Spirit is placed upon the baptized. We are baptized into the name of the Lord Jesus Christ (Acts 2:38), and our name is written in the book of life (Rev. 21:27). This goes together with the declaration of innocence that God makes when He baptizes us and calls us His own. Christ declares us innocent and gives us the hidden manna of His body and blood not because we have been so good, but because we have sinned. He knows we need forgiveness, so He gives it to us freely. Christ was found guilty of our sins and suffered and died for them, so we are declared innocent and acquitted, free from all charges. We are called by His name, and He will take us to heaven to eat the food of angels when we die from this life. Christ keeps us in fellowship with Himself by giving us body and blood in holy communion, that hidden manna that gives us eternal life. And He will take us to His eternal wedding banquet, where we will live under Him in His kingdom and serve Him in everlasting righteousness, innocence, and blessedness, just as He is risen from the dead, lives, and reigns to all eternity. This is most certainly true. Amen. Dear confessors of Jesus as the Christ: grace, mercy, and peace to you from God the Father and our Lord and Saviour Jesus Christ. Amen. We care what other people think of us. We may ask others what they’ve heard said about us because we want to make sure only good things are being said. We are vain. That’s not why Jesus asked, “Who do people say that I am?” Jesus knows what everyone thinks of Him. Jesus wanted the disciples to know and take notice of what the world was saying about Him. The world was saying that Jesus is a prophet. A prophet like John the Baptist or Elijah. They said He was a respectable teacher with teaching worth hearing. Jesus wants His church today to also know what the world says about Him. Guess what? It hasn’t changed. The world still says that Jesus was a prophet. They still say He was a teacher with some good lessons to teach. They say He’s one of the great religious leaders like Gandhi and Buddha. Even Muslims say that Jesus was a prophet like Mohammed. There’s always room for another prophet. There’s always room for another teacher. Even the Pharisees called Jesus “Rabbi,” which means teacher. With teachers you take what you think is good, and discard what you think is not so good. If you don’t like one teacher, you find another. Peter did not confess that Jesus was just another teacher. He confessed, “You are the Christ.” You are the promised Messiah, the Saviour of the world. You are the one anointed by God the Father to save us from our sins. You are God in the flesh, here to save us from hell. We needed saving from hell, because there was not one spot left in us untainted by sin. We were sick with sin’s poison, infected with nothing but grim death in our future. Christ, the Son of the living God, came and took our sentence of death in our place. He never broke any law or committed any crime to receive such a sharp sentence of death by crucifixion. Yet, He was crowned with thorns, smitten, and scourged. He was cruelly mocked and nailed to a tree. Even then the mocking continued. All this was for us. Our sins were the reason Jesus suffered and died. All the wrath and the anguish that Jesus took on Himself was what we merited and deserved. The Shepherd died for sheep that love to wander, and the Master paid the debt His servants owed Him (paraphrased from LSB 439). Jesus is the Christ. This remains the confession of the Church. There is salvation in no other name (Acts 4:12). Peter did not confess this because he was wise and well learned. He didn’t confess Jesus to be the Christ because he was such a wise theologian. He confessed it because it had not been revealed to him by flesh and blood, but by the Father in heaven (Matt. 16:17). Immediately after Peter’s confession, we see his lack of understanding. Peter had just confessed Jesus to be the Christ, and thus the Saviour of the world, but as soon as Jesus started explaining what that would mean, Peter rebuked Him. As soon as Jesus told the disciples that being the Christ meant that He would suffer many things and be rejected by the elders and the chief priests and the scribes and be killed, Peter took Jesus aside and told him no, that’s not how you are going to save us. That’s where our cleverness gets us. Our intelligence gets us to say that Jesus is just another teacher. Our wisdom says that God’s Son should not die to save us. The only way we know the truth about the promised Christ is if it is revealed to us by the Father in heaven. It is not from our great studies or learning or wisdom that we figure out God’s truth. Rather, God reveals His truth to us in His Word. His Word is truth. God’s Word reveals Jesus to be the Christ, the Son of the living God. God’s Word reveals that it was necessary that Jesus die on the cross to pay for our sins. No other payment would have been enough. Then God takes us miserable sinners and claims us as His own in the waters of Holy Baptism. He washes us clean from all our sins and joins us to Himself. It is not through our intelligence or wisdom that we become children of God. Those who think that we choose God and believe in Him through our own reason and strength thus reject infant Baptism. They say babies haven’t done the studies necessary to be baptized. They’re not smart enough for Baptism. They’re not learned enough. This brings us back once again to where our learning and intelligence get us. They get us to say that Jesus is nothing more than a good teacher and that He should not die for our sins. They get us to rebuke Jesus’ suffering and death as a good plan of salvation. In other words, they get us nowhere as far as salvation is concerned. Only through God the Father revealing to us that Jesus is the Christ do we believe and then confess this to be true. “I cannot by my own reason or strength believe in Jesus Christ my Lord or come to Him.” We need the Holy Spirit to call us by the Gospel. We need the Holy Spirit to wash us and claim us through the waters of Baptism. We need the Holy Spirit to enlighten us with His gifts. We need the Holy Spirit to sanctify us and keep us in the true faith. This the Holy Spirit has done despite our reason and our intelligence. He has washed away our sin and given us faith to confess that Jesus is the Christ. God has revealed to us in His Word that we have peace with Him because of Jesus’ death in our place – that great payment that was required for our sins to be paid. While we were still sinners, Christ died for us and saved us from the wrath of God by justifying us by His blood. Our sins are forgiven. We are reconciled to God. Thus, the Church has always confessed and will always confess who Jesus is. He is not just another teacher or prophet. He is not just one of many religious leaders from whom we pick and choose what we like. Jesus is the Christ – the anointed Saviour of the world. He is our Saviour from sin, death, and the devil. There is salvation in no other name. Amen. Dear church of Christ who will not be hurt by the second death: grace, mercy, and peace to you from God the Father and our Lord and Saviour Jesus Christ. Amen. We focus far too much on our first death, that is, our physical death. Our time and energy and money are consumed by the things of this life, rather than that which relates to eternal life. We thus show we are more concerned with our first death than we are with the threat of the second death, which is eternal death, or with eternal life. If we are honest with ourselves and count the hours we spend on matters related to this life versus the matters related to eternal life, we will see that this is very true. We spend hours working for material goods to benefit us in this life. We spend energy on planning meals, shopping, and cooking to nourish our physical bodies. We spend money on recreation, leisurely pursuits, and getting rested so that we can go back to work for more material goods and nourishment for our bodies. How many hours per week do you spend on spiritual pursuits which relate to eternal life? How much time do you spend per week on planning and ensuring your spiritual nourishment? How much money do you spend per week to ensure that you will receive spiritual rest in this place to strengthen you through the spiritual battles of this life to eternal life? This examination of our own failures can help us to understand why tribulation or persecution can be good for the Church. Tribulation can change our focus to the eternal, instead of being so preoccupied with the temporal. Tribulation can cause us to release our grip on the things of this world that are passing away, and cling to what is eternal. However, for the Church in Smyrna facing tribulation, persecution did not help them focus on the eternal. They were in poverty and being slandered by the unbelieving Jews, who Jesus calls a synagogue of Satan. Jesus told them that the devil is about to throw some of them into prison as persecution was about to increase. They were afraid. The Church in Smyrna may not have focused as much time, energy, and money on the pursuit of material goods, nourishment, and leisure as they had before the tribulation, but they were still focused on this life. They were still afraid of the first death, their physical death from this life. Tribulation undoubtedly refocused their use of time, energy, and money, but now they lived in fear over what was about to happen to them and what slanders were spreading around about them. They were still more concerned about their monetary poverty than spiritual riches. Their focus was fear of persecution; fear of suffering; fear of death. Here too, in Smyrna, the people were more concerned about their first death, than about eternal life. Thus, Jesus writes the Church in Smyrna a letter saying, “Do not fear what you are about to suffer… Be faithful unto death and I will give you a crown of life… The one who conquers will not be hurt by the second death.” These are words of comfort to troubled and fearful hearts. Because these words of comfort are “the words of the first and the last, who died and came to life” we don’t have to be afraid of the first death. Christ is the first because He is the cause and source of our faith and life since He died and came back to life. He is the first, because He is the founder of our faith (Heb. 12:2) and the first born from the dead (Col. 1:18). Christ is the last, because He is the goal and object of our faith since He is the giver of eternal life. We also heard in Peter’s First Epistle of the living hope that we have through the resurrection of Jesus Christ from the dead, to an inheritance that is imperishable, undefiled, and unfading, kept in heaven for us. In this we rejoice, though now for a little while, if necessary, we are grieved by various trials (I Pt. 1:3-6). A little while. Ten days. It’s not worth comparing to eternity in heaven. It’s not worth comparing to the glory and joy of heaven. This is Christ’s promise to His Church. So, do not fear. Do not fear those who kill the body but cannot kill the soul (Matt. 10:28). Do not fear the first death because you will rise from the dead. Do not fear the second death, which is eternal death, because Christ writes to His Church that you will not be hurt by the second death. Christ will give you the crown of life – a symbol of victory over fear, death, and the grave. Christ wore a crown of thorns and suffered and died for you, so that you have the promise of the crown of life and eternal life with Him in heaven. This inheritance is waiting for you. It will never perish. It will never be defiled. It will never fade. Thus, do not fear what you are about to suffer. Spend time in reading God’s Word and serving your neighbour. Spend your energy in making sure you receive spiritual nourishment. Spend your time, energy, and money on supporting this congregation, and come here often to receive spiritual rest, nourishment, and strength for the days ahead. Do not fear. Do not fear even though the earth gives way, and the mountains be moved into the heart of the sea (Ps. 46:2). Do not fear because it is not up to you to keep yourself in the faith. It’s not up to you to nourish or strengthen yourself spiritually. God does these, but He does them through means. He does these things through His Word and Sacraments. Christ is the first and the last, who died and came to life. His Church is in His hands. You are in His hands. He will keep you faithful to death and give you the crown of life. Through faith you will conquer, and you will not be hurt by the second death. Amen. Dear tempted saints: grace, mercy, and peace to you from God the Father and our Lord and Saviour Jesus Christ. Amen. Lead us not into temptation. These are the words Jesus taught us to pray. We have in the Small Catechism a great treasure for the church. It so wonderfully summarizes the faith and gives simple explanation for young and old alike. You can do no better than to recite portions of it every morning and evening. If you don’t know what to do for daily devotions, pick up your Small Catechism. If you don’t have a Small Catechism, pick one up from the table in the narthex. But back to our text. God tempts no one. From where do temptations come? Temptations come from the devil, the world, and our sinful nature. This desire varies from person to person, and even within a person from youth to old age. In younger years, temptation is often in sins of the flesh. In middle age, it’s often money and power that are the greatest temptation. In older years, it is often the desire to live forever that is the greatest temptation. Most often, however, we do not and cannot anticipate what will tempt us, from where the temptation will come, or when it will come. The truth is that anything can be a temptation for us. We can be tempted to overwork, we can be tempted to be lazy. We can be tempted to meddle in other people’s affairs, or we can be tempted to be indifferent to other people altogether. We can be tempted into hardness of heart and believing we need no forgiveness or we can be tempted to believe that our sins are too awful to be forgiven and thus be tempted to despair. Temptation is not just into obvious vices and evil. Temptation comes like a wolf in sheep’s clothing, disguising itself as something good. Material possessions are a good blessing from God, but we are tempted to be more attached to God’s physical blessings than His spiritual blessings. Having a good reputation is a blessing from God, but we are tempted to not speak up when we should, for fear of the disapproval of others. Leisure time is a blessing from God, but we are tempted to do anything except study God’s Word when we have free time. Thus, there are temptations for us everywhere and with everything. These temptations come from within us, as we desire what God forbids. The world adds to the temptation because the world does what it wants and seems to enjoy it. The devil adds to the temptation because he is ever seeking our fall. Everything God does, He does for our eternal good. Everything the devil does, he does for our eternal ill. God wants you to trust Him in poverty, illness, and failure and He wants you to trust Him in wealth, health, and success. The devil wants you to distrust and question God in poverty, illness, and failure, and not to think of God at all in wealth, health, and success. Thus, we pray to God, saying lead us not into temptation. Guard and keep us from falling into temptation. We cannot avoid temptation with out own strength. If we could, we would have no need to pray this petition. We pray this petition because we need God to fight temptation for us. Hebrews tells us that Jesus is able to sympathize with our weaknesses, as He was tempted in every respect as we are, yet without sin. The devil threw every temptation he could muster up against Jesus, but Jesus did not sin. The cunning father or lies is no match for the Word of God. Jesus won the battle. Jesus gave us an example of how to fight the devil’s lies with the Word of God, but He is not merely an example for us in fighting temptation. His victory over temptation is our victory because He is our substitute. His obedience is our righteousness as we heard from Romans, because He is our substitute. Jesus was obedient to the point of death on a cross. There He also acted as our substitute. He lived our life and He died our death. In His life He fought temptation for us and won, and in His death He paid the price for our falls into temptation. And Jesus sympathizes with your weaknesses. When you feel all alone in temptation and think that no one understands; when it seems like your whole life is taken over by some desire, know that you are not alone. Jesus is there and He sympathizes with your weaknesses. He knows what it’s like to be tempted. He suffered when tempted so His heart aches when He sees you suffering in temptation, and He helps you in temptation (Heb. 2:18). Jesus sympathized with your weaknesses to the point of death. It is for you that Jesus suffered and died. It is for you that He rose again. His victory over temptation is your victory over temptation, and His victory over death is your victory over death. Amen. Dear church of Christ who will eat of the tree of life: grace, mercy, and peace to you from God the Father and our Lord and Saviour Jesus Christ. Amen. Christ Jesus, the Lord of the Church, sent seven letters to seven churches. Tonight, we focus on His letter to the church in Ephesus. The church in Ephesus was enduring and bearing up under the great difficulty of having false teachers in their midst. Jesus specifically praises them for hating the false teachings and works of the Nicolaitans, which Jesus says He also hates. The church in Ephesus was clinging to the truth of the Gospel in the midst of trying times and false teachings. Jesus does have something against them, however. They had abandoned the love they had at first. When the Gospel had first reached Ephesus, those who believed the Gospel had responded with great love. They loved gathering to hear God’s Word in church. They loved sharing what they had with the needy. They generously gave offerings to the church so that more people could hear the good news that had saved them. They did good works in the community out of love for God and love for their neighbour. They did these good works since they were so filled with love because their sins were forgiven and they had the promise of eternal life. Over time, however, their love had grown cold. They no longer had the same love for God which they had at first, so they did not do the same works they did at first. They no longer showed love for their neighbour. They no longer showed love for hearing God’s Word. Jesus warns in the Gospel according to Saint Matthew that in the latter days, “Because lawlessness will be increased, the love of many will grow cold.” (Matt. 24:12) This happened in Ephesus already at the time of Jesus’ letter to them. Lawlessness was great in Ephesus. This is evident from the influence of the Nicolaitans in Ephesus. The Nicolaitans were an antinomian cult participating in offering food to pagan gods and cult prostitution, quite likely connected to the popular goddess Artemis of the Ephesians. There is documentary evidence of the worship of up to 50 gods in Ephesus, but all paled in comparison to Artemis, the temple built to her being numbered among the seven wonders of the ancient world. Jesus commends the church in Ephesus for hating the works of the Nicolaitans, but these evil works around them still influenced their love to grow cold. The church had condemned the works of the Nicolaitans, but they still lost members to the cult. They had done outreach to their pagan neighbours, but their neighbours didn’t come to church. They had helped the poor and needy in Ephesus, yet they still had the poor and needy around them. They had taught their children the faith, yet their children were being lost to the world and its enticements. All their works did nothing. Their love grew cold. It’s not just their love for good works that grew cold. Their love for God grew cold. These are really one and the same. Their love for God grew cold, because they thought He should be doing more in Ephesus. They thought God should knock over the great temple built for Artemis; that God should take care of the poor and needy; that God should bring these worshipers of false gods to a knowledge of the one and only true God. Because God didn’t do what they expected Him to do, their love for Him grew cold, and they stopped inviting their neighbours to church. They stopped helping the poor and needy and reduced their offerings to God. They stopped teaching their children the faith. In the first chapter of Revelation, we heard that the lampstand is the church. Thus, Jesus is saying, if you don’t repent, I will remove the church out of Ephesus. If you do not repent, I will take away my Word and Sacraments from you. If Jesus wrote a letter to the church in Melville, what would He say? Has our love for God grown cold because of lawlessness that God has not curtailed? Has our love for our neighbour grown cold as there continue to be poor and needy even though we have helped them? Have we stopped doing the works we used to do because our invitations to our neighbours and children and grandchildren to join us in church have gone unheeded? Christ’s warning to the church in Ephesus is His warning to the church in Melville and to the church in every city in the world. Repent. If you do not repent, I will remove the church out of your midst. Jesus is simply calling for us to love Him and trust Him, even if He doesn’t do what we think He should do. And since Scripture teaches that faith without works is dead, that is, it is not true faith (James 2:17), we strive out of love for God to serve our neighbour. Not to earn salvation, for this we can never do, but willingly and joyfully because we are already saved. Galatians teaches, “Let us not grow weary of doing good… as we have opportunity, let us do good to everyone, and especially to those who are of the household of faith.” (Gal. 6:9-10) This does not mean that our invitations to others to come to church will be accepted and our church will grow. It does not mean that our congregational budget won’t be tight. It doesn’t mean that there will be no more poor. It means that out of our love for God, we do good, regardless of the outcome, regardless of success or failure, regardless of the lawlessness around us. Revelation twelve tells us that Satan has been conquered by the blood of the Lamb (Rev. 12:11). Romans eight tells us that we are more than conquerors through Him who loved us (Rom. 8:37). In Christ by faith, we are conquerors, and will eat from the tree of life in paradise. Adam and Eve did not get to eat from the tree of life which would have caused them to live forever as sinful beings (Gen. 3:22), but when we are brought into the joys of paradise as sinless people, we will get to eat from the tree of life and live forever. In fact, we already get to eat from the tree of life. Not the one in paradise, but the word Jesus uses which is translated as tree, is more often used to refer to wood which has been cut down, and thus points us to the tree of the cross. The fruit of the cross is the forgiveness of sins, which we eat every Sunday in the Lord’s Supper, and which we eat again tonight. This fruit of the cross keeps us in Christ, so that we are conquerors, and will be strengthened in faith and in good works until we eat of the tree of life in paradise. Because of the fruit we eat from the tree of life now, we receive the forgiveness of sins. Because we receive the forgiveness of sins, will live forever, and will join Christ our dear Saviour and Lord of the Church in the paradise of God. Christ has made sure of it by shedding His blood on the tree and thus conquering Satan. Christ has made sure that we will eat of the tree of life in the paradise of God by giving us the fruits of the tree of His cross in His body and blood given and shed for us. Amen. Dear people in the veiled presence of God: grace, mercy, and peace to you from God the Father and our Lord and Saviour Jesus Christ. Amen. There is only one emotion present when sinners are in the presence of the glory of God. That emotion is fear. In the presence of the glory of God Almighty, man falls on his face in terror. As Jesus walked around looking like any other man, He was hiding His glory. His glory was veiled so everyone did not fall down in fear around Him. On the mount of Transfiguration, Peter, James, and John got a glimpse of Jesus’ glory and heard God the Father’s voice from heaven and were terrified and did fall on their faces (Matt. 17:6). Mankind is sinful, so we can have no other reaction to God’s glory than falling on our faces in fear. Scripture tells us that on Judgment Day, every knee will bow to Jesus, the judge of the living and the dead (Rom. 14:11). Whether you’re a believer or an unbeliever, you will bow down to God in His glory because of your sin. Our sin will make us fear. In the presence of the glory of God, however, we will be acutely aware of our sinfulness. We will fall on our faces in fear at the judgment seat of Christ. Christ will not leave us in fear. As Jesus touched the disciples on the mount of transfiguration and said to them, “Rise, and have no fear” (Matt. 17:7), so He will raise us off our faces and tell us not to be afraid. We do not have to be afraid because Jesus was punished for our sins. The Almighty God took on human flesh, veiling His glory. He veiled His glory so that He would give His life as a ransom for our lives. Our sins were and are such a big deal that they required God to die in order for them to be covered. It required the life of God in the flesh to pay the price of our sins and thus save us from eternal damnation. Jesus will raise us up off our faces and tell us, “Rise, and have no fear. I have paid the price of your sins.” His forgiveness is so great and overflowing, that it covers even those sins into which we fall repeatedly; those sins of weakness which we hate and detest. Jesus’ forgiveness covers those sins we have brought into the lives of others. Jesus doesn’t ask, “How many times must I forgive you?” He is the one who taught unlimited forgiveness when He said, “If [your brother] sins against you seven times in a day, and turns to you seven times, saying, ‘I repent,’ you must forgive him.” (Luke 17:4) If he demands such forgiveness from you, do you seriously think He will not show such forgiveness to you? That’s why God the Father says, “This is my beloved Son; listen to Him.” Listen to Jesus for forgiveness and eternal life. He is the one foretold by Moses and Elijah. Listen to Him. All the Old Testament points to Jesus. Everything that God said for thousands of years was about the coming of the Christ. Now that He has come, listen to Him. The prophets of old searched and inquired carefully to learn about the promised Christ (I Pt. 1:10). They did not have first hand knowledge of the divine mysteries concerning which they prophesied. They simply repeated faithfully what God had told them to say. Now, in these last days, God has spoken to us by His Son. Not just another prophet bringing the Word of God, but He is Himself God, the eternal Word (Jn 1:1). He speaks as one who has authority, because He has all authority in heaven and on earth (Mt. 28:18). Jesus is not just one of many topics in the Bible. He is the way, the truth, and the life (Jn 14:6). If you take Him out of the Scriptures, you have nothing left. Thus, when Jesus sent out His apostles, He did not send them to talk about their own views and ideas. He sent them to talk about Him. He is the one to whom we should listen. His voice is the voice we hear on the pages of sacred Scripture. Listen to Him. Christ Jesus came to you hidden in the waters of Holy Baptism. He comes to you veiled in the bread and wine of Holy Communion. He needs to be hidden and veiled so that you are not overcome by your sinfulness in His glorious presence and fall on your face. We would be afraid of the sacraments if we could see what happens in them. Jesus knows us. He knows our sins and He knows our fears. Therefore, the washing of rebirth and renewal by the Holy Spirit He veils with water. 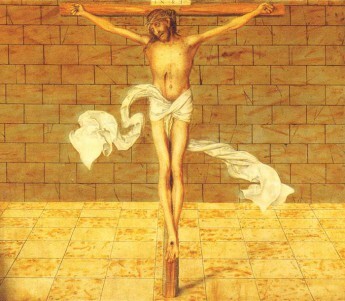 His body and blood for the forgiveness of sins He veils with bread and wine. He knows you need the forgiveness of your sins, so He gives it to you freely. He knows your frailties, so He gives the forgiveness to you in these veiled ways, so that you will not fear. There will come a time when we will not fear to see God face to face. It will be when we are raised with perfected and sinless bodies that are spiritual and imperishable (I Cor. 15:42,44), and we will be like God, because we will see Him as He is (I Jn 3:2). Then we will dwell in His presence forever without fear because we will be without sin. Then we will not fall on our faces in God’s glorious presence because we will be glorious in His glorious presence. Until then, we are in the veiled presence of God. He is here because He has promised us, “Where two or three are gathered in my name, there am I among them.” (Mt. 28:20) He is here because He has promised us, “Take eat, this is my body… drink of it all of you, for this is my blood…” (Mt. 26:26, 28) He is here because He has promised us, “Behold, I am with you always, to the end of the age.” (Mt. 28:20) Amen. Dear hearers of preaching: grace, mercy, and peace to you from God the Father and our Lord and Saviour Jesus Christ. Amen. God is not a vending machine. You don’t put in a dollar and then make your selection of what you want. This is the way false gods are worshiped. The prophets of Baal thought that the longer they prayed, and the more intensely they prayed, the more they would be heard by Baal. When they would not receive an answer, they would cut themselves in the hopes of getting their false god to have compassion on them and answer their prayer (cf. I Ki. 18). Offering sacrifices to idols was in order win to the favour of the idols. If food offerings didn’t result in an answer to their prayers, then they would try animal sacrifices. When animal sacrifices still did not result in the idol answering their prayer, they would even offer their children to be sacrificed, as the followers of Molech did. The thinking was that if you wanted the god to answer your prayer, you had to offer a sacrifice that was great enough. You put in your dollar and make your selection. Atheists use a similar misunderstanding of God as an argument that there is no God. They say, “I prayed to God and He didn’t give me what I wanted, so there is no God.” I made my selection on the vending machine, but I didn’t get what I wanted, so I do not believe. But God is not a vending machine, regardless of how people think of Him. He’s got better things prepared for us than we can even understand. The whole city gathered at the door of the house where Jesus was. They wanted healing. They wanted sicknesses and diseases gone. Jesus did heal many. He healed many who were sick or oppressed by demons, as He had healed Simon’s mother-in-law from her fever. Preaching is better than healing. Healing leads to living longer in this sinful world, but preaching leads to eternal life in the new heavens and the new earth. Yet, we do pray for healing. We pray for healing for ourselves and our loved ones. We keep hitting the healing button on the vending machine and are disappointed if all we get is preaching. We’d rather have the healing than the preaching. It’s not that healing is bad. Healing can mean less pain. Healing can mean more time to spend with our families before we die. Healing can mean hearing more preaching before we die. Healing is, however, temporary. We will all still die. Healing just puts off the inevitable for a little while longer. Illnesses and sicknesses will return. Death will come. In the end, healing makes us no better off. Preaching teaches God’s Word and tells us what God’s will is for our lives. Preaching convicts us of sin and brings us to repentance. Preaching creates and sustains trust in Jesus for the forgiveness of sin, and it thus makes us eternally better off. Sometimes we need illness. We may need it to humble us. It is a very humbling thing to have your body or mind fail and require the help of others. It is humbling to be bedridden or confined to a wheelchair. God certainly can use illness to crush our sinful pride and give us humility. Illness also can make us think of eternal matters. When we are healthy, we are busy with the things of this world. Illness can make us reflect on the fact that we will all die. Illness can prompt in us a greater desire to hear preaching and the Word of God. God can use illness to turn us away from the world and open our eyes to better things. Whether God sees it fit to give healing or not, He does not give it because of anything we have done. God does not answer our prayers because our prayers are long or well-worded or intense. He doesn’t answer our prayers because we have sacrificed greatly or given Him offerings. Everything God gives to us, He gives only out of Fatherly divine goodness and mercy, without any merit or worthiness in us. Even the illnesses that He gives to us, He gives to us out of love, desiring what is for our eternal good. Unlike a vending machine, what God gives to us is not His response to what we have given to Him. It’s the other way around. God gives to us first. He gives blessings to us, so that we have something to give to Him as an offering. He gives us the greatest good – the forgiveness of sin – so that our hearts would be freed to give offerings to Him willingly and joyfully, not under compulsion. He gives us eternal life, so that we will not cling to the things of this earth like they are going to last, but that we would release our hold of what God has entrusted to us and use it for the eternal good of others, by supporting preaching here and around the world. Preaching is better than healing, because it brings not just temporary healing, but eternal healing. If you do pray for healing from illness, just know that God may say no to healing in this life, and instead bring you into His eternal joys where you will have eternal healing. Pray for preaching. Pray that God will graciously grant you to hear the preaching of His Word for all the days of your life. Pray that God would grant your children and grandchildren preachers who preach His Word. Pray that God would give you a desire to hear His Word, and that He would give you wisdom and understanding when you hear it preached. There is nothing better than hearing the Gospel preached to you. Jesus died for you, so your sins are forgiven. Your sins which plague you cannot keep you from heaven because your sins have been removed from you. You have the promise of eternal life. Nothing can separate you from the love of God in Christ Jesus our Lord. You have the promise of being healed eternally from all illnesses and sicknesses, where you will see God face to face, and He will wipe away every tear from your eyes. Eternal healing is God’s promise to you, and that promise gives you trust in God through all the illnesses of this life. Amen.